What to eat in Lucknow is one of the most important things to know about Lucknow. The City of Nawabs is known for the centuries-old Awadhi cuisine, which is mostly influenced by the culinary culture of the Mughal era because the Mughal Emperors hired officials for administration of the Awadhi Province. The traditional Indian food menu has incorporated Lucknow food from the Awadhi cuisine over years. A paradise for foodies in India, Lucknow City is a labyrinthine trail of food from biryanis to kebabs, chaats and paans. Indian Eagle explores the Lucknow food trail and dares to cut the long list of dishes short so that you don’t feel spoilt for choice. Biryani is one of the unique things to eat in Lucknow. It is one of the must-have dishes on the traditional Indian food menu. Influenced by the Awadhi cuisine during the era of Nawabs, Lucknow Biryani is unlike the Dum Biryani of Hyderabad in cooking style and flavor. Rice and meat are cooked separately. Both are mixed later and flavored with garden-fresh spices. Lalla Biryani and Wahid Biryani are the places to eat in Lucknow. The former is famous for mutton biryani and the latter is known for chicken biryani. Among other dishes served at Lalla Biryani, mutton korma and mutton kebab are simply irresistible. 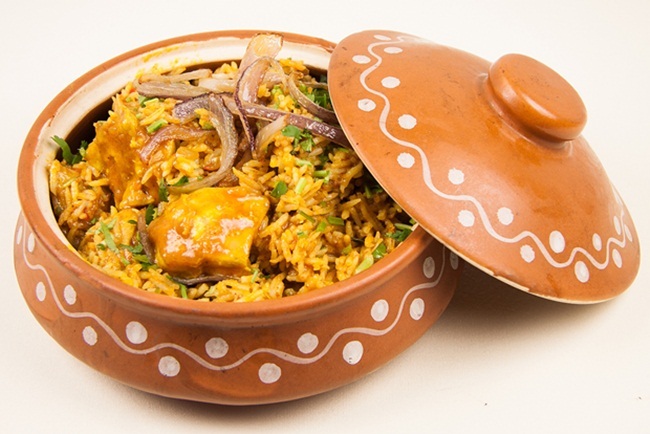 Since 1955, Wahid Biryani has been a favorite of foodies. It is a must stop during food tours in Lucknow City. Wahid Biryani has been featured in many newspapers, food shows and travel videos for its USP that is the rare blend of 56 difference spices. Even they serve visitors at the Taj Mahotsav in Agra. You can visit the by-lanes of Aminabad in the old city for vegetarian versions of Lucknow Biryani. Galawati Kebab or Galauti Kebab is what to eat in Lucknow during a trip or food tour. It is said that the recipe was invented for a change of taste when a Nawab wished to eat something new that would melt in his mouth. Galawati Kebab does really melt in the mouth as it is made from ground meat. Add Tunday Kababi near Akbari Gate to your list of best places to eat in Lucknow City as it serves authentic Galauti Kebab with paratha. Chicken Korma is another must have at this food joint. Galauti Kebab is also known as Tunday Kebab (Tunday means handicapped). It is called so because the person who invented the recipe was handicapped. This Lucknow food owes its unique flavor to the blend of 100 spices. 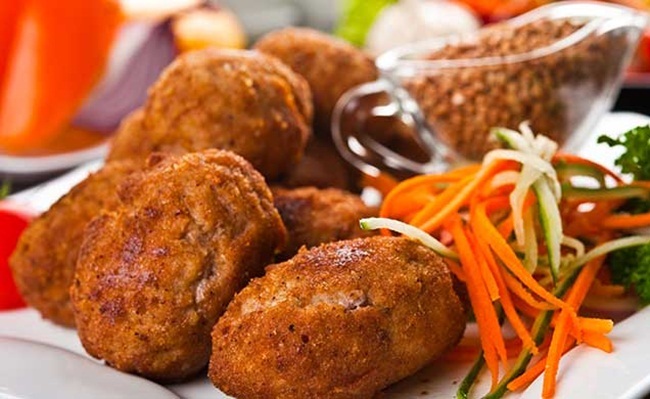 Of the Lucknow Kebabs, Boti Kebab is served as a starter. It is made with tender pieces of meat under intense heat. It is a Mughlai dish from the Awadhi cuisine. You should add Tokri Chaat to your list of never-tasted-before things to eat in Lucknow. 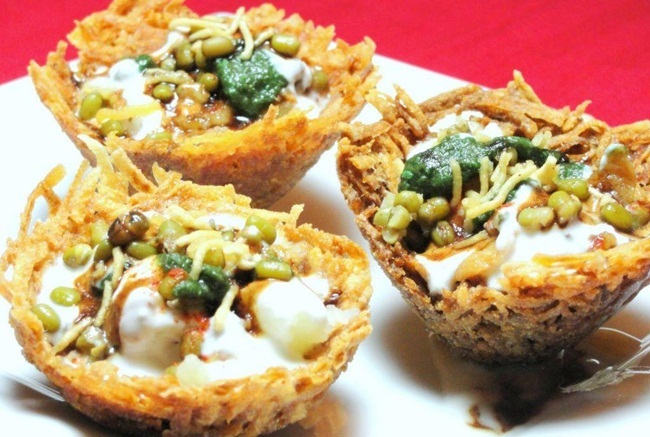 Generally, chaat is an Indian street food and a popular monotony-breaking snack. Tokri Chaat is a Lucknow-special dish of deep-fried basket-shaped dough filled with a mix of boiled peas and potato mash. Unique to the City of Nawabs, it is unlike the varieties of chaat that Delhi, Agra, Nagpur and Indore fare famous for. Royal Café in Hazrat Ganj Market serves the best of Tokri Chaat. Sheermal is a sweet version of naan (baked flat bread) savored with anything spicy in contrast to it. Sheermals are made of refined flour mixed with sweetened, warm milk and flavored with saffron. Don’t forget to get your taste buds blessed with contrasting flavors of sheermal and a spicy curry. 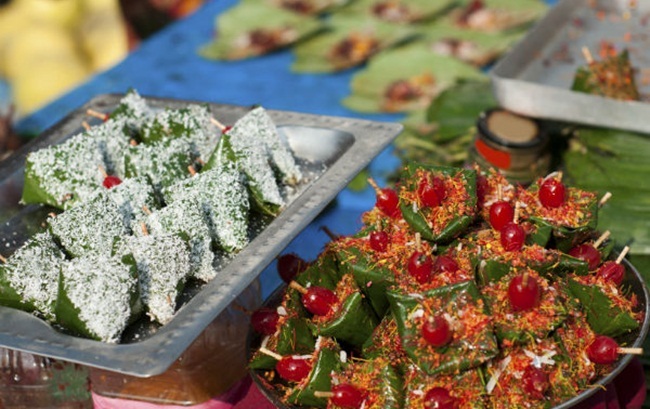 Lucknow and Varanasi (or Banaras) are the ultimate stops for paan lovers and paan eaters in India. No meal is complete without a Lucknowi paan, which is not just another experience. Stuffed with several different tongue-teasing ingredients including mango pulp in summer, paan is omnipresent in this Indian heritage city. Mango Paan at Mehrotra Paan Corner is a unique bliss of Lucknow. The list of things to eat in Lucknow does also have Malai Ki Gilori for those having a sweet tooth. Soft in make, this sweetmeat melts in the mouth within seconds. Pista Barfi is another famous sweet treatment for the taste buds in the city. Your tour of the best places to eat in Lucknow would remain incomplete without an experience of Prakash ki Kulfi and Chanakya ki Kulfi. These two varieties of kulfi in different flavors including malai, rose, elaichi and kesar-pista will leave an indelible impact on the foodie in you. Parkash ki Kulfi with sweet noodles is a must try in Aminabad, and the place offering Chanakya ki Kufli exhibits food related poems on the walls. 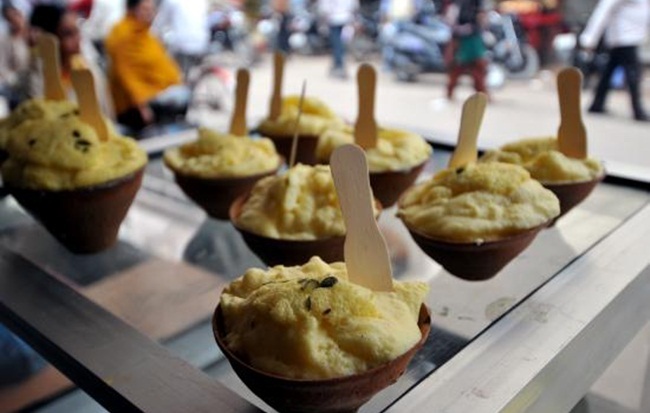 If you happen to visit Lucknow during winter, don’t give a miss to Makhkhan Malai. Known as Lab-e-Mashook in Urdu, the delicacy is sold near Kali Temple at Chowk in the old city. With Paya ki Nihari, we at Indian Eagle are back to the non-vegetarian menu that Lucknow City is famous for. 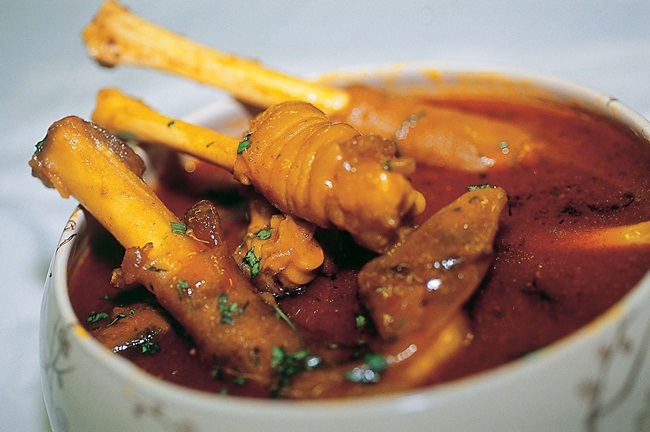 It is a spicy broth of lamb trotters, cooked slowly for 6-7 hours. Lucknow owes this dish to Haji Abdul Rahim Sahib who started serving it with kulche for morning breakfast in the year 1890. Since then, the city has been breaking its fast with a bowl of Paya ki Nihari and a plate of kulche in the morning. October to March is the best time to visit Lucknow, one of the weekend getaways from New Delhi. The Double-decker AC Train is the best of all Delhi to Lucknow trains. It covers the distance between Delhi and Lucknow in 7 hours. If travel by train is not your cup of tea, book a domestic flight to Lucknow from Delhi. Indian Eagle offers the best itinerary to Lucknow including the cheapest international flight to New Delhi and the best domestic flight to Lucknow from Delhi. The lowest airfare and the best service are guaranteed! Excellent,This post is looking wonderful.Lucknow city of Nawab is known for the centurion old Awadhi cuisine. We can say that the land of nawabi cuisine, Lucknow is a heaven for all foodies.